This is indeed the most dreaded topic to discuss and even teach. If playing the tabla is not “hard enough”, tuning them is even more difficult. The soloist may not have to worry about tuning, while proper tuning of the tabla is absolutely imperative in accompanying a vocalist or an instrumentalist. HOW DO THE WORDS “TABLA” AND “TUNING” FIT? In order to utilize this, tuning that tune to a special note is important to fit the melody. The dayan has to be tuned to the tonic. In Indian music, this is known as sadja or sa. For instance, a song sung in a key of C should have the dayan tuned to the C. The note C is known as the tonic or the “sa” in Indian music. If a vina player was to be the leading artist and his instrument’s pitch is G, then the dayan should be tuned to G, as G is the “sa” of whatever the vina player wishes to play. * = These are approximate readings. Skin thickness, thickness of syahi, and drum quality are other factors as well. ** = C is denoted to middle C.
Dayans can obviously be smaller than 5” and bigger than 6.” In addition, the readings here are just approximates. I used to have a 5.25 inch dayan and I was able to tune the drum all the way up to G above middle C. It began to sound a lot like a naal, a Mahashtrian drum used in folk music. This was due to the fact that my dayan’s head was very thin and the syahi was even thinner. To date, I have a “teacher’s pair” with a dayan size of 5.5” and it cannot go beyond B. Depending on your tastes, look for a tabla that suits your style the best. One day, a local sitar player hears that you play tabla and you are a promising instrumentalist. You ask the sitar player which note she tunes her sitar and she tell you that the note of her sitar is D. The key of D on a sitar is usually the highest in normal sitars. Your tabla tunes up to G, as it is a 5.75” dayan. Assuming that you read this tabla guide and understand how much emphasis there is in tabla’s necessity in being properly tuned, you start to panic. What will you do? First solution is to explain to the artist that your drums cannot tune to her key of D. First, ask if it is okay to tune your dayan to fifth note. The fifth note is known as “pancham” or “pa” for short. If you studied music theory, you probably already know that the tonic and the fifth have a strong relationship and the most stable relationship harmonically. Pa is the second best route if the tonic does not work. If you look at the scale of D (D E F G A B C D), the note “A” is the fifth note in the scale. Before you get cracking on how to tune the drum to A, ask the leading musician if it is okay. You probably ask “why must I ask the musician first?” The reason is that the musician might select ragas or Indian modal melodic forms which might not have a fifth. Thus, the drum would have to be tuned differently, if it cannot reach the tonic. Raga Malkuans, a famous midnight raga, completely omits pa, and has its strength on the fourth note, known as madhyama or ma. If the dayan would be tuned to pa, then Raga Malkauns would sound very disastrous and loose its potency. In order to fit with the raga, the dayan must be tuned to ma. In the sitar example, this note would be G. If the sitar player would be playing Raga Malkauns, then his tabla tuned to G would have been just fine. Most evening ragas lack both a pa and a pure ma. There is sharpened ma known as tivra ma. However, the relationship between the tonic and tivra ma is very dissonant. Usually, these evening ragas contain the pure sixth note known as shuddha dhaivata or dha. Try to tune your dayan to dha. If it cannot reach “dha”, then tune it to the major third note known as shuddha gandhara or ga.
Ga and Dha are not as potent as ma or pa, but it is has some capability to hold some form of harmonic stability with the tonic. WHAT NOTES NOT TO TUNE YOUR DAYAN? The augmented fourth and the tonic have the worst relationship in harmony. The second and the seventh, known as rsabha (re) and nisada (ni) respectively, whether they are in their pure form or flattened form should not be considered for tuning. They are too close to the tonic. For this reason, the tabla will sound sour and will make the entire piece off-key. For this reason, we can now see why the tonic is the best. It holds true for all songs, given that the tonic note is the same. There won’t be any need to change the tuning to fit the raga. Now we know what to tune the tabla to, we have to go about how to tune it. In order to go about tuning, we finally use the tabla hammer. Every tabla set should have came with a special hammer. If your set lacked a hammer, then order one. A regular tool-kit hammer will not do the job and may end up permanently destroying your tabla. Another ingredient will be patience. This job can be very cumbersome and annoying, but it is a skill every tabla player should know. Before we start attacking the drum, find a note to tune your tabla to. Use an electronic sound generator, tanpura, harmonium, or anything that will produce the melodic pitch that you want to tune your tabla to. This is the goal note. Play “na” and “tin” all around the drum. Is it anywhere close to the note you are looking for. If it is more than a whole step, you will need to add more tension to the drum. 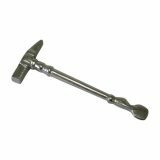 Use the sharp end of your hammer and attack the gatta downwards. Do this to all of the gatta and listen to the “tun” echo’s pitch get higher and higher. After striking the gatta downwards till the point of resistance, play “ta” and “tin” all the way. Chances are they will not sound the same. Look at the figure below. There is an “X” shape on the head of a dayan. One line segment represents the points where one of the two pitches (let’s call it pitch A) is exactly the same. The line of the X represents all the points where pitch B is present. Between the two line segments are pitches which are undefined. You can see in the diagram that tension works in 180 degrees. 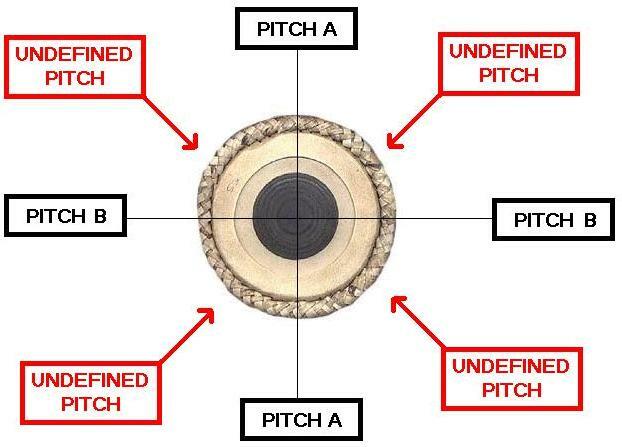 Our two goals in tuning the dayan are 1) to tune to the desired pitch and 2) to get an equal pitch all around the dayan. Take the flat part of the hammer and strike down on the gajara between the two tasmas of the section that has a lower pitch. 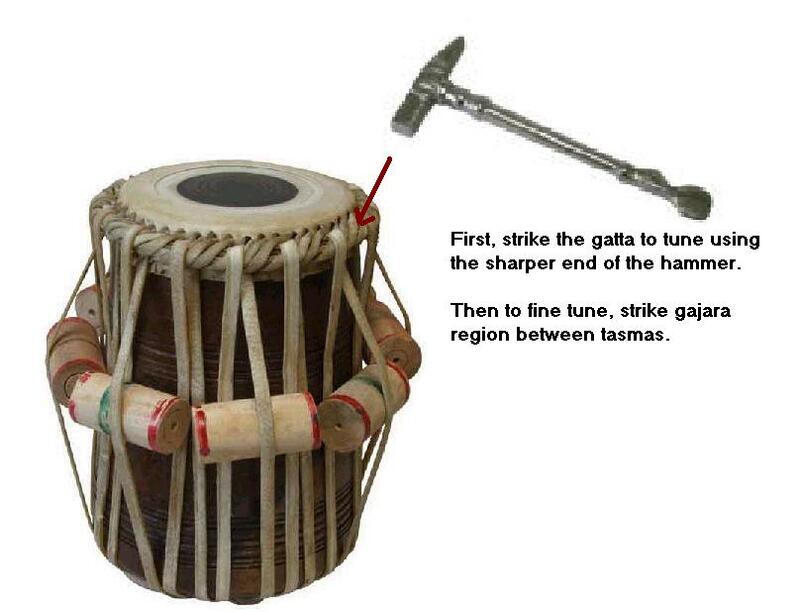 Striking the hammer downwards to the gajara increases the pitch of that particular region. Remember, pitches work in 180 degree groupings. By increasing one end, you’ll increase the pitch on the other end too. 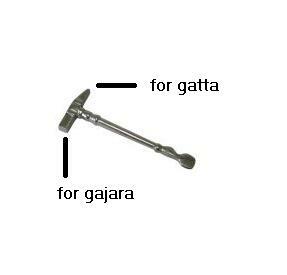 Likewise, for all the high parts of the X, take the hammer and do an underhand strike on the gajara. This upward strike will lower the pitch. In hammering the gajara, do not strike it so hard! This will cause either a distortion in pitch or break the gajara. Another big problem that many inexperienced tabla players face is missing the gajara and hitting the kinnar by accident. Be very careful not to hit any part of the wood or skin while hammering gajara. Accidental striking of the wood or skin will cause irreversible damage to the dayan! Of course, if one follows the warnings, this should seem like a piece of cake. Unfortunately, it isn’t. This is anything but a piece of cake. Tuning can sometimes take five minutes on a good quality drum, ten minutes on a mediocre quality, and perhaps forever or even impossible on a poor quality drum. It’s not just the head that contributes to the tuning aspect, it’s also the the tasma, the gatta size, the tension, and the strength of the kundal. It’s all an interconnected system. There are a couple of reminders when tuning the dayan. First reminder is that made sure the pitch is practical for the dayan. If you have a 5.5” dayan diameter and you are attempting to tune it to E, then the head will surely split. If you are insistent on getting a dayan that can tune to E, the simplest solution is to purchase a dayan with that tuning range. Some full fledged artists carry several dayans for this reason. Another point is to use “na” and “tin” bols to determine sound. “Tun” should never be used, as it is not the primary sound used. Even though “tun” may sound like the pure second or shuddha re, the interval will vary. In fact, not every tabla will have a suddha re sound. Some will even go up to the minor third (komal ga) or the flattened second (komal re). Thus, “na” and “tin” will be determinants of the tonic and accuracy whether the tune is fully tuned or not. Some people can be a little lazy and just use “na” alone as the determining bol. “Na” can actually deceive the ear, for the sound of “na” includes the sound from the wood. The bol “tin” is a better choice as “tin” does produce the same theoretical sound as “na” and does not include the sound of the wood. If one wishes to try this, “tha” can be used in played of “tin. Since the baya’s bols are pretty much open and not closed, the primary objective is to get the baya tuned to either “pa” or “ma.” Again, if a raga lacks pa or ma, then use Ga or Dha. Under all normal circumstances, tune the baya to ma. If one attempted to play “ta” on the baya, then it’ll be clear that the baya will not have equal sound all around. One can do the same process as it was for the dayan, although it really wouldn’t matter too much. Of course, if all of the points were equal, then the baya will sound even more lively. This holds true with the dayan’s “tun” when played on an equally tuned dayan. Tuning is never easy and is a daunting task. All it takes is practice and experience with the right drum and right training. Of course, mistakes happen. Tasmas snap, heads split, syahis particles fall off. What do we do? The next and the final chapter will make you ready for such circumstances.